I love meals that come together so quick, and that are tasty as well as pretty family friendly. 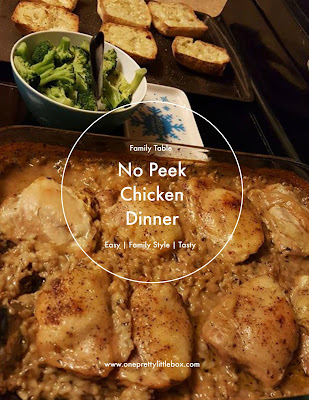 A family friendly meal to me is something that everyone eats without complaining! With five of us in the home, all with various taste buds and family favorites, it is often difficult to please all of us at the same time. Someone is usually making a compromise of some sort. This recipe however is tasty, quick to put together, and cooks while you are off doing other things such as reading, cleaning, whatever! I often like to cook it on any given Sunday but let me tell you it was pretty tasty on a Thursday too! 1. In a large casserole dish dump the box of rice and seasoning packet in. 2. Add to the rice the soup and a can of water and the onion soup mix. Mix until well combined in the dish. 3. Top the rice mixture with the raw chicken and sprinkle the packet on top. 4. Cover with foil. This is called "no peek" for a reason! 5. Place in a 375* preheated oven for one hour and 45 minutes. On this particular night I served this with steamed broccoli and garlic Ciabatta bread. You could serve with any veggie and roll that you desire. Serves six very comfortably with left overs!